The 72nd annual Tony Awards, presented by the Broadway League and the American Theatre Wing, will have enough star power to light not only 50th Street and Avenue of the Americas but also all of Times Square. The list of mega talent guests could light the world! The Awards will telecast live Sunday from 8 – 11 P.M. from Radio City Music Hall on CBS, proudly entering its 60th year as Tony’s network. 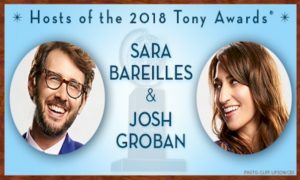 Waitress creator [and former star; recent Jesus Christ Superstar live telecast] Sara Bareilles and multi-talented pop/crossover singer Josh Groban [Natasha, Pierre, and the Great Comet] are hosting Broadway’s penultimate, always-glittering event. As in previous years, there will be lots of social media action and surprises. The network begins full Red Carpet arrivals at 5 P.M. Remember the old M-G-M axiom: “More stars than there are in the heavens!” Well, the goal of the 2018 Tony Awards is to top that. 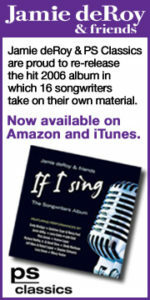 There’ll be more stars than there are in the galaxy – and many of them will be singing and dancing! Bruce Springsteen will make not only a rare TV appearance in appreciation of his Tony honor for Springsteen on Broadway, but also perform. He will be introduced by old friend Billy Joel. 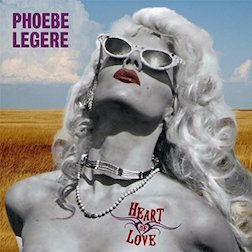 The roster of guests and presenters includes Lifetime Achievement recipients Chita Rivera and Andrew Lloyd Webber; Uzo Aduba, Christine Baranski, Mikhail Baryshnikow, Erich Bergen (Waitress), Clare Danes, Jeff Daniels, Robert De Niro, Brandon Victor Dixon, James Monroe Iglehart, Christopher Jackson, Patti LuPone, Katharine McPhee, Matthew Morrison, Carey Mulligan, Leslie Odom Jr., Kelli O’Hara, Jim Parsons, Zachary Quinto, Bernadette Peters, Andrew Rannells, Kerry Washington, and Marisa Jaret Winokur (Hairspray). Production numbers by the casts of Tony-nominated shows The Band’s Visit, Carousel, Frozen, Mean Girls, My Fair Lady, Once on This Island, SpongeBob SquarePants and SUMMER: The Donna Summer Musical. Returning for a performance is 2017 Tony-winning musical Dear Evan Hansen. 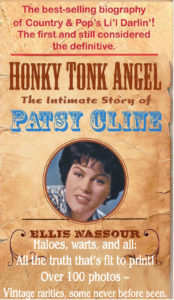 Tony telecast veterans Ricky Kirshner and Glenn Weiss of White Cherry Entertainment return as executive producers of the Awards; with Weiss also directing. At the Broadway League, Tom Schumacher is chair and Charlotte St. Martin is president; at the American Theater Wing, Heather A. Hitchens is president and CEO. Behind-the-scenes coverage links are www.TonyAwards.com/secondscreen, Facebook.com/theTonyAwards, @theTonyAwards on Twitter, and Instagram.com/theTonyAwards. Join the conversation using hashtags #TonyAwards2017 and #TheatreInspires. 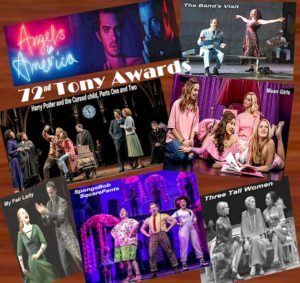 Sponsors for the 2018 Tonys are IBM, Carnegie Mellon University – the first-ever higher education partner; official hotel Sofitel New York; City National Bank; accounting services Grant Thornton LLP; the Rainbow Room; People/Entertainment, Playbill, EBG Premium, and official airline United Airlines. 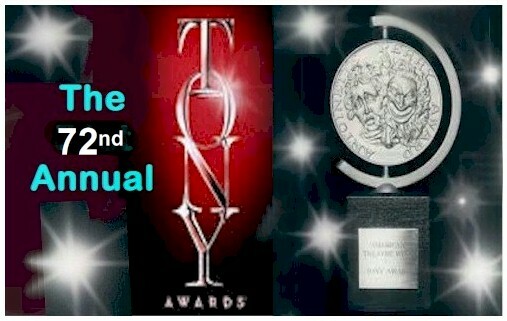 For a complete list of the nominations, a printable ballot for your picks to win, video features and interviews, trivia, and a history of the Awards and the Awards namesake Antoinette Perry, go to www.TonyAwards.com. Regional Theatre Tony Award – La MaMa E.T.C.